As I mentioned here, I am planning to take N1 this summer. I have always been lazy about the JLPT but I figure that the certification might come in handy someday. One of my friends mentioned that he was using a free app called i-Sokki (limited version) for drilling vocabulary for the exam. I downloaded it last week and I really like it so far. I-Sokki is easy on the eye. It’s a nicely designed app. 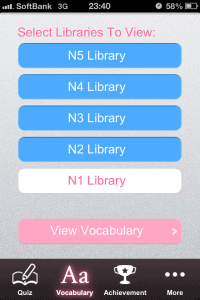 It comes with the vocabulary for N5 unlocked already. You have to pay to get access to the other levels, but at $1.99 per JLPT level or $4.99 for all levels, the price is reasonable. I’m mainly working on N1 words but, just in case, I’m brushing up on the N2 vocab too so I bought the whole set. There are three different quiz modes for testing your vocab knowledge. All of them are multiple choice. Japanese Mode tests from Japanese to English so it is probably the easiest test as you can intelligently guess a lot of words without truly knowing them. Kanji mode tests from Japanese to the kana reading. I use this one a lot. One small gripe I have with the Kanji mode is that you can only see the English meaning after you have finished the review session. I would like the option to quickly remind myself of the meaning but anyway, it’s a minor flaw. 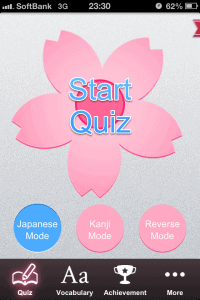 Finally, there is Reverse Mode which, as you might expect, tests you going from English to Japanese. I rarely use this one. The app tests you based on your “familiarity” with the various vocabulary. I think they do a solid job. 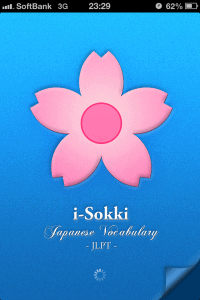 I’m using I-Sokki during the little moments when I’m sitting on the train or waiting for a friend. I look up new words in my Wisdom Dictionary (reviewed here) and read through the example sentences to help the meaning take root in my mind. This strategy is working well so far, although I passively know most of the vocabulary already. Depending on your Japanese level, your results may differ. I-Sokki is not a perfect app. Sometimes I find the same vocabulary repeatedly coming up on the tests, so I’m confused how the algorithm works. Also, there is obviously no way that the app can know your starting knowledge so you have to review a bunch of known words in the beginning. The biggest downside for me though, is that the other words in the test are usually very different from the correct answer. The kanji mode, for example, will often show three ridiculous meanings that are obviously incorrect with one reasonable looking answer. This makes things too easy as you can guess the answer without even knowing it. In the JLPT, similar looking answers are displayed to confuse you. I wish this app did the same. One way to get around this is to mentally test yourself before looking at the four choices being displayed. With the few caveats I mentioned, i-Sokki is a handy tool for studying for the exam. I recommend you pick up the free version and see how you go. We like what we see, but we’re still trying to figure out this Google Plus thing. Follow us on there to stay in the loop. We also also do Facebook and Twitter. I would like to inform all JLPT takers here, that there is this free app called “Learn Japanese JLPT N1” or something, created by “Viet talent”, which is actually more about preparing the JLPT1 than learning Japanese. It is basically an data base of hundreds of vocabulary and grammar MCQ questions (more than 2000 in total) which look every bit as genuine questions from the JLPT, with a “practice” mode to browse through all the questions, and a “test” mode to try and answer 25 questions in 25 minutes, at the end of which you browse back through all 25 questions and see which ones you got wrong. I’m using it all the time; it doesn’t train you to get used to the actual format of the test, but once you’ve gone through every questions, I think you’re pretty much vocabulary-proof. (best used in parallel with an android/laptop Japanese dictionary to check all the nuances of the words as you go). I think it’s only fair that I share this lucky find here. I can’t seem to download the app from Firefox. The “This addon from addon.mozilla.org could not be installed because it does not match the addon Firefox expected” error keeps showing up every time I try to download it. Is there some other way I can download just the .xpi or something? 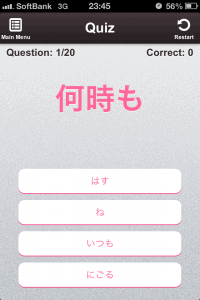 The http://www.kanjigames.com has online versions of two mobile apps, ‘Kanji Connect’ and ‘Lex Flashcard Game for Quizlet’. Kanji Connect is a game like Boggle but the target word is cued with kanji or hiragana and meaning, and you need to spell out the word in the grid. Great thinking game to get to know kanji readings and meanings and learn new vocabulary – it also tracks progress and has reference flashcards. 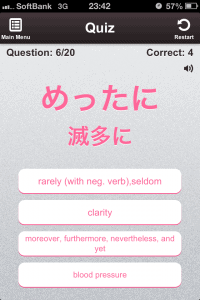 The Lex Word Game app is a similar game but allows you to put in your own data via Quizlet, and allows for longer strings (including English words, or short Japanese sentences). N.B. It takes about 3 minutes tops to export a Perapera list of lookups, upload it to Quizlet and then import into the Lex app so that you can review your lookups in the game. No other apps feature this kind of game plus review and progress tracking! Both games are also iphone apps available on the app store.